NJTV is a Public Broadcasting Service (PBS) member network serving the U.S. state of New Jersey. It is owned by the New Jersey Public Broadcasting Authority (NJPBA), an agency of the New Jersey state government which owns the licenses to all but one of the PBS member stations licensed in the state. NJTV is operated by WNET.org, which is the parent company of New York City's flagship public television stations, Newark-licensed WNET (channel 13) and Garden City, New York-licensed WLIW (channel 21). WNET.org runs NJTV through a subsidiary non-profit organization, Public Media NJ. NJTV's operations are based in Englewood, New Jersey. Its anchor studio is located at Gateway Center in Newark. Master control and some internal operations are based at WNET's studios in the Worldwide Plaza complex in midtown Manhattan. NJTV airs PBS programming and also produces and broadcasts its own programs mostly related to issues in New Jersey. NJTV is the successor to New Jersey Network (NJN), the state-controlled public television and radio service. 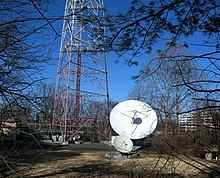 NJN ceased operations on June 30, 2011, and Public Media NJ took control of the former NJN television stations the following day. Officials with the New Jersey Network asked the New Jersey Legislature in 2008 for permission to explore making NJN a community licensee owned by its fundraising arm, the NJN Foundation. However, on June 6, 2011, Governor Chris Christie, who vowed to end state-funded public broadcasting when he took office in 2010, announced an agreement to turn control of the NJN television network to WNET. As part of the deal, WNET.org created Public Media NJ as a separate New Jersey-based nonprofit to operate the stations. Under the terms of the deal, Public Media NJ would operate the stations for a five-year period, with two additional five-year renewable options. The NJPBA would retain the licenses, while Public Media NJ would receive funding from the Corporation for Public Broadcasting (CPB) and all revenues related to the former NJN technical operations. The measure was defeated by the state assembly on June 23, 2011. The state senate, however, passed the resolution on June 27, allowing Public Media NJ to take over NJN's television operations as scheduled on July 1, 2011. All members of NJN automatically became members of NJTV. The first program to be aired on NJTV was Charlie Rose (which is produced by its sister station WNET). NJTV's first logo from 2011 to 2017. On July 26, 2011, NJTV announced a partnership with the Foundation for New Jersey Public Broadcasting (formerly the NJN Foundation) to jointly fund and create additional public affairs programming. NJTV and the NJN Foundation merged in September 2012. The Caucus Educational Corporation (CEC), a non-profit producer of New Jersey-focused public affairs programs, is under contract with Public Media NJ and WNET to provide original programming for NJTV. CEC produces Caucus: New Jersey, State of Affairs, and One on One with Steve Adubato, which are hosted by Steve Adubato. CEC also produced the New Jersey Capitol Report, which ended after a seven-year run in March 2017. NJTV also broadcasts programming distributed by PBS, American Public Television, and additional local productions. At the inauguration of NJTV, the network launched NJ Today, a half-hour newscast that replaced NJN News and was aired on its former weekday time slots of 6, 7:30 and 11 p.m. It was originally anchored by WNET personality Rafael Pi Roman. Mike Schneider later took over the anchor roles. It was renamed to NJTV News on November 4, 2013. On June 12, 2014, Schneider announced his retirement as anchor on NJTV News and was replaced by veteran journalist Mary Alice Williams on July 1. Schneider still appears on other WNET and NJTV produced programs, including Metrofocus. NJTV News is produced at the Agnes Varis studio in Two Gateway Center in Newark. The newscast can also be seen on sister station WNET and online via YouTube and on NJTV's website. Michael Aron, the system's news director at its closure and a former member of the foundation's board, revived his former NJN programs Reporters Roundtable and On the Record on NJTV. He also appears on NJTV News as its chief political correspondent. NJTV remains the only PBS member network that does not air PBS NewsHour. When NJN shut down operations, no New Jersey Lottery drawings were aired until September 8, 2011, on a tape delay. Before this happened, the New Jersey Lottery had no other outlet to showcase any of their live drawings except via online live streaming services such Ustream and Livestream.com. NJTV continued hosting the tape-delayed drawings until January 1, 2013, when the drawings were moved to two CBS owned stations, WLNY and WPSG-TV. As of 2016, lottery drawings are aired live on two Tribune Broadcasting-owned stations, WPIX and WPHL-TV. NJTV's four full-power stations reach a potential audience of almost 28 million people in parts of five states—all of New Jersey, plus parts of New York, Connecticut, Pennsylvania and Delaware. While this gives NJTV one of the largest potential audiences in the country, it also must compete directly with three of the most-watched PBS member stations in the country. It not only shares its coverage area with sister stations WNET and WLIW, but also with Philadelphia's main PBS outlet, WHYY-TV (channel 12). Additionally, WLVT-TV (channel 39) in Allentown, Pennsylvania overlaps some of NJTV's broadcast area. 1In the FCC incentive auction concluded in 2017, WNJT and WNJN's spectrum was sold back to the government for $138,059,363 and $193,892,273, respectively. NJPBA has announced that these stations will share spectrum with the two remaining stations, WNJS and WNJB respectively. 2 WNJN used the callsign WNJM (the M standsfor Montclair) from its 1973 sign-on to 1994. On January 23, 2018, per FCC filings, WNJN began channel-sharing with WNJB and WNJT began channel-sharing with WNJS. All translators directly repeat WNJN's signal. NJTV is available on all New Jersey cable providers. In addition, WNJN is available on several cable and telephone company providers on the New York side of the New York City market, as well as the New York DirecTV feed. WNJB is available on Charter Spectrum's systems in Manhattan and Staten Island, as well as the New York Dish Network feed. WNJS is available on most cable and telephone company providers in the Philadelphia area, as well as the Philadelphia DirecTV and Dish Network feeds. 1 Each station's respective callsign with "-DT" suffix serves as the PSIP name for the various NJTV stations. ^ "New Jersey Public Television Inaugurates New Agnes Varis NJTV Studio in Newark with Ribbon-Cutting Ceremony". NJTV Pressroom. May 28, 2015. Retrieved January 17, 2019. ^ Behrens, Steve (May 12, 2008). "With Its State Aid Shrinking, NJN Asks for Independence". Current. Archived from the original on June 17, 2011. Retrieved July 1, 2011. ^ Press release (June 6, 2011). "Gov. Christie Selects WNET for NJN Takeover" Archived June 10, 2011, at the Wayback Machine. NJN (via WMGM-TV). ^ "N.J. Assembly Rejects Plan to Transfer NJN Management to N.Y.-Based WNET". The Star-Ledger. June 23, 2011. Retrieved June 27, 2011. ^ "N.J. Senate Fails to Block WNET Plan, Ending NJN Network". The Star-Ledger. June 27, 2011. Retrieved June 28, 2011. ^ "YouTube". www.youtube.com. Retrieved January 17, 2019. ^ "NJTV board votes to merge with former NJN foundation that raised millions for network". Star-Ledger. June 14, 2012. ^ Aregood, JT (December 9, 2016). "Adubato and Pi Roman Announce the End of 'NJ Capitol Report'". Observer. ^ Strupp, Joe (August 13, 2012). "Changing Channels: NJTV's Second Act". New Jersey Monthly. ^ "NJTV News with Mike Schneider: Nov. 4, 2013". YouTube. November 4, 2013. Retrieved January 17, 2019. ^ "Mary Alice Williams to Take Helm of Njtv News on New Jersey Public Television; Mike Schneider Named Senior Correspondent". NJTV Pressroom. June 12, 2014. Retrieved January 17, 2019. ^ "Montclair and NJTV perfect together; state's public TV station bursts with township talent". Montclair Times. August 23, 2012. ^ "2 popular NJN shows to return to air on NJTV". Associated Press. February 22, 2012. ^ "Former NJN Staple Michael Aron to Join NJTV". The Star-Ledger. July 26, 2011. Retrieved August 12, 2011. ^ Drucker, Judith. "Live Television Broadcast Gives New Jersey Lottery Players Even More Ways to Watch the Winning Number Drawings". New Jersey Lottery. Archived from the original on July 7, 2013. Retrieved May 15, 2013. ^ Federal Communications Commission (April 13, 2017). "FCC Broadcast Television Spectrum Incentive Auction: Auction 1001: Winning Bids" (pdf). Report dated April 4, 2017 but not published until 4/13. ^ Janssen, Mike (April 13, 2017). "Sale of dozens of noncommercial signals in FCC spectrum auction earns minimum of $1.8 billion". Current. Retrieved April 14, 2017. ^ "Licensing and Management System". enterpriseefiling.fcc.gov. Retrieved January 17, 2019. ^ "RabbitEars.Info". www.rabbitears.info. Retrieved January 17, 2019.